Despite the claims of fundamentalists and the “creation science” they’ve been touting for decades, evolution is a scientifically documented fact that can be observed both in the lab and in nature. Through evolution, animals and plants adapt to their environment and those that can’t run the risk of extinction. This is true regardless of whether or not a supreme being had any part in the creation of the universe. If such an entity was responsible for creating the building blocks for all that exists, then evolution must have either been part of the plan, or at least encouraged by it. Still, in one crucial area, it’s our ancestors to whom we owe the greatest thanks, since much of the food humanity has consumed throughout its existence is not in its original form found in nature. Wheat, barley, corn, and other grains have been cultivated by humans into their more edible forms for several thousand years. If there had been an intelligent designer meticulously crafting every element of the world in which we live, the plants humans rely on for food would have been in their final forms on the last day of creation and yet, humans, through cultivation and hybridization, have been making wild plants more palatable since the dawn of agriculture. In the untamed world created by nature, some mushrooms are edible; others are toxic. Of the ones that are toxic, some may give a person mild digestive problems, others will kill a person by shutting down the kidneys and liver. To the untrained eye, it’s difficult to tell the difference. Many of the cultivated fruits we’re familiar with are also much different than their wild counterparts. In the original specifications for bananas they are largely inedible to humans — compact, very starchy, and filled with large, hard seeds. Humans cultivated two wild species for thousands of years to bring about the many edible varieties of bananas we recognize and consume today. 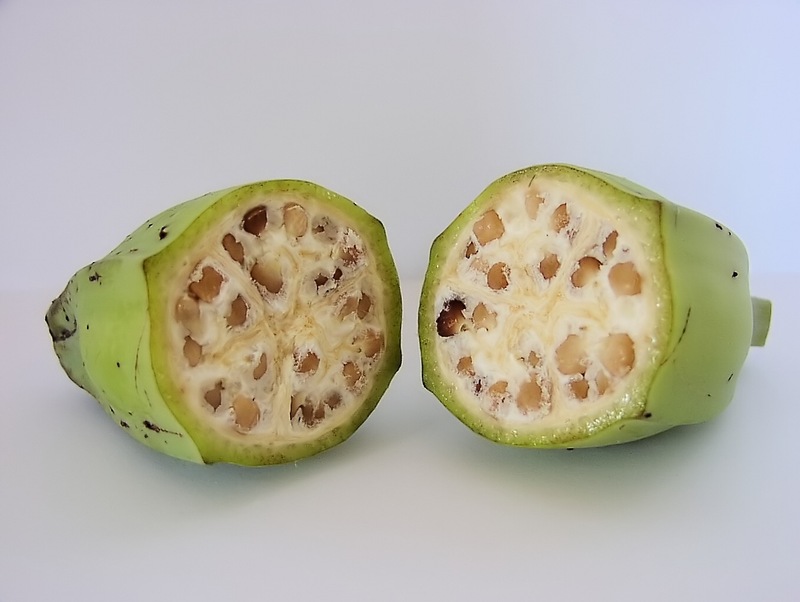 An example of one of the wild banana species from which modern bananas were cultivated. Credit: Warut Roonguthai, 31 March 2007. Distributed free via Wikipedia Commons. Cultivation does not always yield the perfect fruit. Strawberries may look alike, but anyone who has ever tasted one can attest to the fact that there’s not always consistency in how they taste. Not only is there no consistency in how strawberries in general taste, there’s no consistency among strawberries grown in the same patch. Some are juicy and sweet; some are very tart and some are simply horrible to taste. Flavorings based on strawberries give us the mistaken impression that all berries taste alike but one only needs to bite into one to know that’s not always true. Agriculture is, of course, the main ingredient for civilization. Once our ancestors could grow their own food and reliably supply feed for their flocks, they were able to stay in one place and begin building the complex societies humans are famous for creating. There are other social animals on the planet, apes, wolves, geese, but none who’ve quite excelled at building the types of societies humans have.